If you frequently work on a computer, you probably have experienced wrist pain. The wrong mouse can make the problem worse. Carpal tunnel syndrome is a condition that affects the hand and arm, causing pain, tingling, and numbness. This happens when the median nerve in the hand is compressed or squeezed. If you, like many modern people, spend a lot of time on your computer working or gaming, you might have (or be at risk of developing) carpal tunnel syndrome. 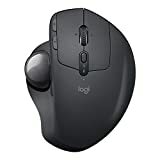 My favorite pick is the Logitech MX ERGO, which has an adjustable trackball and a shape that supports your palm. If you are left-handed, a good choice would be the Adesso iMouse E9. Its a vertical design allows you to operate the mouse with your wrist in a neutral position. A carpal tunnel-friendly mouse, on the other hand, is designed to increase comfort and reduce the strain put on your wrist. While some mice have a vertical structure for this purpose, others are simply shaped in a way that supports a more neutral, natural position for your hand. If you’re looking for a plug-and-play mouse that comes with 30 feet of coverage, you might want to consider the Logitech MX, which comes with a sculpted and stable tracking ball. This mouse allows you to hold your arm in a supported, comfortable resting position, taking tension off your hand. The Logitech MX ERGO trackball stays stationary, and you won’t have to move your hand as you click around on your computer. Minimizing your hand motions will help give you a break and lessen muscle fatigue. Due to its design, this mouse can be used anywhere, even with limited space. Check the price for the Logitech MX ERGO on Amazon. For people who are interested in trying out a vertical mouse, the J-Tech Digital V628 could be a welcome change for helping reduce carpal tunnel symptoms or risk. 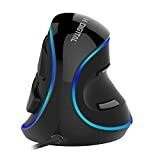 This mouse is built for endurance and long periods of working, which is especially helpful for people who sit at their computers for hours at a time. The J-Tech Digital V628 can help ease your hand or wrist fatigue, letting you scroll and click all day long without extra discomfort. This mouse definitely looks different than you’re used to, but the Anker Ergonomic Mouse supports the neutral hand position you need when dealing with carpal tunnel risk or symptoms. Designed to help you with efficiency and productivity, while minimizing pain, this ergonomic mouse has a pyramid-like shape that is easy to adjust to, even if you’re coming from using a mouse with an ordinary shape. Overall, using this mouse feels very natural and intuitive. Are you suffering from weakness or discomfort in your hands? Then the HAVIT Ergonomic Wireless could help. While the standard-shape mouse forces your wrist into an unnatural position, this ergonomic option fits more comfortably in your hand, reducing awkwardness and strain. It may take a bit of time to adjust to this position after being accustomed to a traditional mouse, but once you get used to it, you’ll likely prefer it. The HAVIT Ergonomic Wireless Mouse has six buttons altogether and allows you to effortlessly rest your fingers and thumb on it as you work or game. 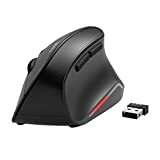 People with a dominant left hand will need to find a product that’s built especially with them in mind, which is where the Adesso iMouse E9 comes in. This fashionable ergonomic mouse has an attractive vertical design with a blue light and glossy black case. It helps you rest your forearm in a comfortable position which can minimize unnatural twisting and wrist pain. Using it will feel similar to the hand position you use when you shake someone’s hand. 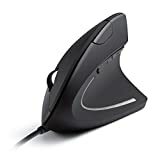 Check the price for the Adesso iMouse E9 on Amazon. You might have a few worrying symptoms such as numbness or tingling in your hands or a full-on diagnosis from your doctor. Or perhaps you just want to take precautions now to ensure that you don’t increase your odds of getting it later. Whatever the case, familiarizing yourself with risk factors for developing or worsening carpal tunnel is a reasonable course of action, along with getting an ergonomic mouse. Traditional mice force you to hold your hand and arm in an awkward position for hours at a time. Pay Attention to Your Posture: Although your focus will understandably be on your hands and wrists when you have carpal tunnel, don’t forget to also pay attention to the rest of your body. When you slouch, everything else goes out of alignment. Make sure you sit up straight, so you don’t worsen existing symptoms. Take frequent breaks: Make sure you are breaking up your time spent in front of the computer with breaks where you stretch out your hands and wrists. Sitting in the same position for literally hours can worsen this condition. Use Less Force: You might be gripping items, such as your mouse, with more force than is actually necessary simply out of habit. Try being more mindful of how much force you’re using and lessening it to give your wrists and hands a break. Even reducing the pressure, you use in daily activities slightly can improve your condition and symptoms. Using a Brace: This tip is more geared towards people with a more advanced carpal tunnel, but in some cases, a wrist splint made for people with this condition may be helpful. This can encourage your wrist to stay in a more natural position when you’re not using your computer. Carpal tunnel syndrome shouldn’t be ignored or brushed off as something insignificant. Start taking these steps today to improve, prevent, or help with your condition. In addition to these tips and the mice we already discussed, there is something else you can do to help deal with carpal tunnel symptoms. 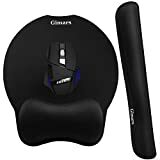 Another step you can take to reduce carpal tunnel syndrome risks or symptoms is a wrist support to use with your mouse. Wrist rests or supports can help you hold a neutral, natural arm and hand position as you work at your desk. These products give you additional cushioning for your wrist to support your arm and some of them even come with antimicrobial properties. Since carpal tunnel syndrome is caused or worsened by a lack of proper support, mitigating this issue is essential for addressing the condition. One product to consider for easing your carpal tunnel symptoms is the AmazonBasics Gel Mouse Pad, a gel-filled wrist rest that provides comfort and support. This mouse pad will conform to your wrist and has a rubberized base to keep it stationary as you work. The high-quality surface is made from cloth and helps your mouse glide smoothly over it. The mouse pad is compact and easy to use just about anywhere you need to work. Another potentially suitable option for people seeking a wrist rest mouse pad is the Belkin WaveRest Gel Mouse Pad which provides support and comfort. Ergonomically designed to reduce stress on your wrist, the durable and lightweight design will last for years to come. If you’re seeking a comfortable, durable wrist rest for using at home, in the office, working, or gaming, the Gimars Superfine Memory Foam Pad is another good potential option. This wrist pad makes it easier to type and may also provide you with the pain relief you’ve been looking for. The breathable material and ergonomic feel makes it much easier to sit at your computer for long hours without as much discomfort. It has a non-skid base with a substantial grip so that the pad stays in place. It just might have a significant impact on your carpal tunnel symptoms. There’s no method for preventing carpal tunnel syndrome that works 100 percent of the time. But if you take steps now to reduce the stress on your wrists and hands, you can either stave it off indefinitely or prevent it from worsening. The products and tips in this article are a great place to start. Should I Get a Landline or Cell Phone for my Small Business?